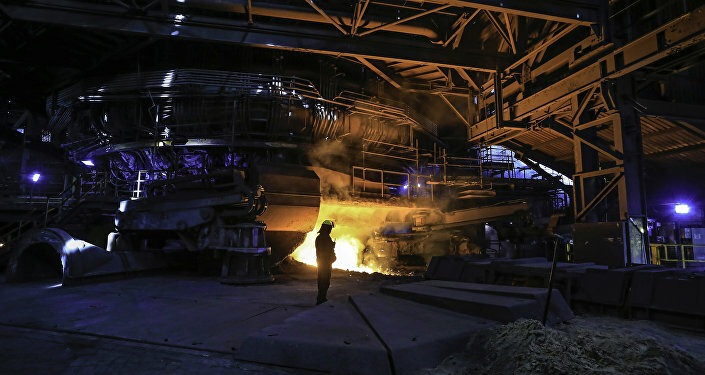 MOSCOW (Sputnik) Sofya Grebenkina - New US import tariffs on aluminum and steel will attract widespread countermeasures and distort global supply chains, an aluminum producer and experts from an industry group told Sputnik on Friday. On Thursday, US President Donald Trump announced that the country would impose tariffs of 25 percent on steel imports and 10 percent on aluminum imports. The official decision will come from the White House next week. Markus J. Beyrer, the director general of the Confederation of European Business, a lobby group representing EU business interests, told Sputnik that the United States risks provoking a trade war, since by imposing these tariffs the country disregards key strategic allies like the European Union. "With this decision President Trump is disregarding the importance of key strategic allies of the US like the EU. There are no winners in a trade war, an escalation will hit everyone," Beyrer said. The same day that Trump announced the new import tariffs, the European Commission responded by issuing a statement in which its president, Jean-Claude Juncker, was quoted as saying that the commission would be looking at World Trade Organization compliant countermeasures. The spokesman for the commission, Alexander Winterstein said at a press briefing on Friday that the EU institution would monitor imports into the European Union and then propose safeguard measures to preserve the market should said imports surge. Trump has not reneged on the tariffs, despite the pledges for countermeasures, writing on his official Twitter account on Friday that when the United States was losing billions of dollars on trade, then a trade war was a positive development and would be easily won. Both producers and industry groups are worried that if the tariffs become official US trade policy, then it will negatively affect global supply chains. Harold Molland, the senior vice president for Communication & Public affairs at Norsk Hydro ASA, a Norwegian global supplier of aluminum that exports primary aluminum and semi-finished aluminum products to the United States, told Sputnik that tariffs will lead to countermeasures specifically because they redirect trade flows, leading to distorted global supply chains. "The introduction of unilateral trade barriers such as quotas and/or tariffs will negatively affect Hydro and would distort normal trade. This could cause artificial redirection of trade flows, for example from the US to Europe, which also could lead to imposition of countermeasures by other countries. All in all, this would result in distortion of supply chains, increase of costs and high uncertainty for businesses due to rising protectionism.," Molland said. So far the decision taken by the United States to impose these tariffs has impacted the markets by affecting stock prices. The export-oriented German DAX index fell 1.8 percent to a six-month low, while the pan-European STOXX 600 was down 1.2 percent. Not only were steel and aluminum stocks down, but the automobile sector also suffered. Fiat Chrysler showed a 6-percent downturn in its stock prices, along with German car producers Volkswagen and Daimler, whose stocks fell more than 2 percent after the announcement of the tariffs. Luisa Santos, director for international relations at the Confederation of European Business, told Sputnik that the new tariffs would mean supply chains would be further disrupted, while other sectors would be wary of remaining unprotected from this same phenomenon. "It would be a new mechanism, added to what already exists and that is very disruptive for the global economy, where supply-chains are very integrated. It is not only a question of so many billions in pure export of raw materials. Other sectors will ask for increased duties to protect themselves, in the wake of this decision. This is very worrying," Santos said. Molland also added that it would not only be European Union producers that would be affected by the tariffs, as US downstream producers could lose their competitiveness, compared with import of final products. According to the US Steel and Aluminum 232 Reports, released by US Department of Commerce Secretary Wilbur Ross in coordination with the White House on February 16, the United States is the world’s largest importer of steel, while aluminum imports to the United States have risen to 90% of total demand for primary aluminum. The report recommended a global tariff of at least 24 percent on all steel imports from all countries, and a tariff of a least 7.7 percent on all aluminum exports from all countries.